The group has been founded in 1984 by the members of the Ulyanovsk State Academic Symphony Orchestra in Ulyanovsk, Central Russia. 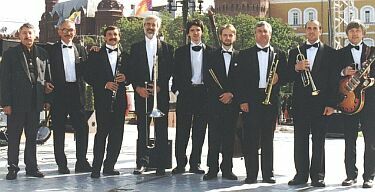 The leader, trombone player Nickolay Novichkov, and trumpeter Vadim Zousmanovsky belong to original band members. 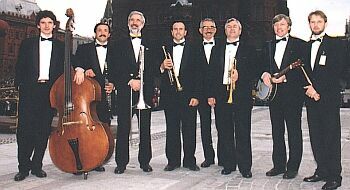 The band's repertoire is based upon traditional jazz in New Orleans style. The second "extra" trumpet in brass section (which traditionally consists of one trumpet (cornet), clarinet and trombone) gives a wonderful peculiarity to Academic Band's sound. Another characteristic feature of the band is a mighty and clear sound of brass, which marked Academic Band's difference between Russian traditional jazz bands even at the first international jazz festival in the city of Kazan where they took part in 1987. That was a result of the classical training of band members which has brightly developed in comparison with others, mainly amateur musicians, who constituted trad jazz community in Russia in 70-80s. The successful performances at domestic jazz festivals in late 80's gave to the band the opportunity to receive an invitation to the most famous European festival of traditional jazz in Dresden (Germany), where "Academic Band" performed in 1989 with enormous success. Only political changes followed "Berlin wall" breakdown and financial problems of the post-perestroika economy stopped the orchestra from developing this success and conquering international jazz stage. The broadening genre limits of the repertoire which was for the main part connected with the arrival of the pianist, soloist and arranger Oleg Ziser, helped to solve the problem of survival, which destroyed many provincial jazz groups to date. At the present time Academic band began to play Ray Charles's repertoire, soul and rhythm'n'blues, jazz-rock fusion pieces which won great public and critical acclaim. The group constantly invites soloists from the neighborhood cities and towns. For example, Academic Band performs with Edward Tumansky whose repertoire contains marvelous songs including Tom Johnes' "Dalylah" and Italian "belcanto" in Luciano Pavarotti's style. Numerous invitations to tours and festivals throughout the country increase Academic Band's significance amid their colleagues. Among the most prominent achievements we can mark out the performance in Moscow House of Composers (invitation by the famous jazz composer Yury Saulsky) and brilliant participation in the cultural program of the celebration of 850th anniversary of Moscow.